Earlier this week the Digital Transformation Office (DTO) launched the beta version of their Digital Marketplace, a directory of vendors offering specialist digital services across a range of role categories. The explicit reason for the Digital Marketplace was to make it easier for small and medium enterprises to engage with government, particular within large ICT projects. It is supposed to do this by allowing agencies to break down large projects into small stages which smaller companies are able to fulfil. At this stage the Digital Marketplace is primarily a list of vendors - over 220. Most are small businesses, with a smattering of recruitment agencies (Horizon, Hudson, Randstadt, Talent International, The Recruitment Hive) and larger companies (such as Deloitte). Right now it's possible for agencies to make both open and select requests to the list for skills via a briefing process, with additional approaches to market, such as an ideation approach both for buyers (roughly 'I have this problem, how would you solve it') and sellers (roughly 'I have this idea to solve a government problem - will anyone fund the work'), still under development. The beta allows for fourteen role categories, covering a wide range of skills in the digital area, with more to come as the marketplace beds down and grows. The current roles are close to the DTO's core business of promoting and incubating digital transformation, which seems a reasonable place for them to start. While the marketplace provides the information in a different way to most government procurement panels, it is governed in the same way - under a standing contract arrangement. At this stage all the innovation is at the front end and it will be interesting to see whether other agencies with whole-of-government panels (particularly Human Services and Immigration) see value in this way of displaying vendors and in the additional features the DTO plans for the site. I've had a good look through the initial Digital Marketplace - in fact I'm affiliated with one of the participating vendors (as would be most private sector digital people in Canberra) - and it was interesting to see how many companies claim to have access to talent that government needs in the digital space. Most government panels have been far more restrictive in the number of vendors they allow on the list, which has led to significant 'horse trading' of panel access and the development of services like SME Gateway to facilitate companies without a panel presence, whereas the DTO has gone for a 'bucket list' of any company that can demonstrate they meet the required criteria. I've done a little analysis of the vendors in the Digital Marketplace and found a few interesting insights as to the responses the DTO received. 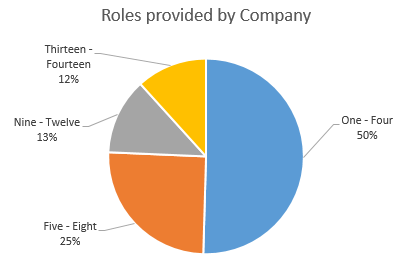 Firstly, half the approved vendors offer four or fewer of the fourteen role categories in the marketplace, with only 8% (generally recruitment companies) offering the full 14. This suggests a lot of specialist providers have joined the service - companies which may otherwise struggle to meet procurement requirements without extensively partnering or contracting their services through larger providers. 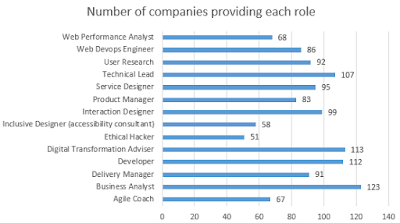 The most popular role offered by vendors was Business Analyst, provided by 123 (or 55%), whereas the least popular was Ethical Hacker, provided by only 51 vendors (23%), followed by Inclusive Designer (Accessibility Consultant) by 58 (26%) of vendors. This isn't surprising. Business Analyst is a standard role that has been around for a long time in ICT, whereas Ethical Hacker is relatively new as a role type and Accessibility remains an underrated area by government (with many practitioners struggling to find sufficient paying work). 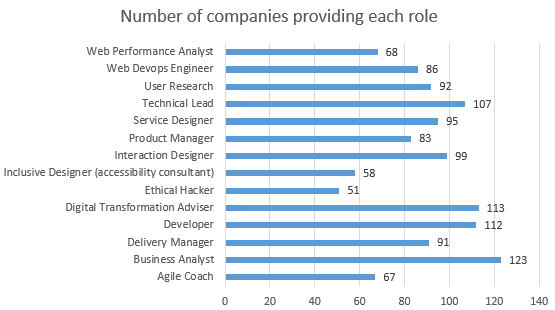 It was interesting how many vendors offered personnel in the Digital Transformation Advisor role, which was second behind Business Analyst (113 vendors or 51%) despite being a very new role type. I'm still sifting through the data and expect to find more interesting insights - particularly from the pricing (for which the DTO has published the ranges by role). This was an interesting decision by the DTO as it may encourage organisations to migrate pricing from below the given range upwards, and once in the range toward its top. A lot of the data exposed in the marketplace has commercial significance, so I may not be able to share all of it, but the site is already gold for organisations seeking to understand the landscape servicing government. Couple the information in the site with industry knowledge and published tender amounts and it becomes relatively easy to identify the high and low price vendors.